4X specialist Hannes Slavik won the Red Bull Pump Track Worlds Qualifier in Austria aboard his BMX bike - here he explains his choice of bike and the pros and cons of each type. We are in the middle of the first ever Red Bull Pump Track race season and that means that some of the qualifiers for the finals already took place and the first riders already got their tickets for an all-inclusive trip to the Worlds in September. Hannes Slavik, the rider you might have recognized from Red Bull’s site header pic can now also smile from the top of the podium at the Austrian qualifying round. However, on one pic used by the promoters the 4X specialist can be seen riding his Ghost 4X MTB and on the other pic his Meybo BMX …that seamed curious to us and so we approached Hannes with some questions about bike choice, training and the whole event. Check out the video of his winning lap below and then dig into the Q&A to learn more. 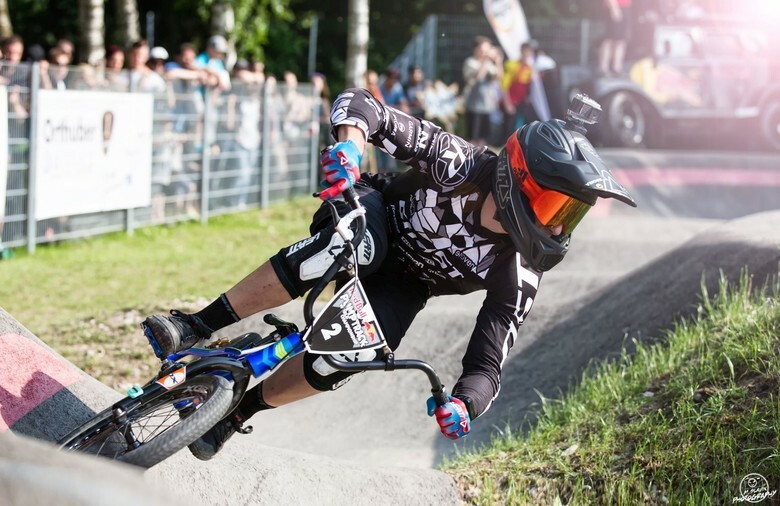 Hannes we know you as a 4X specialist with BMX background, but we did not expect to see you on the small bike competing at the Red Bull Pump Track event in Austria. Do you think MTBs can't win on an asphalt pump track or what’s the reason for your bike change? 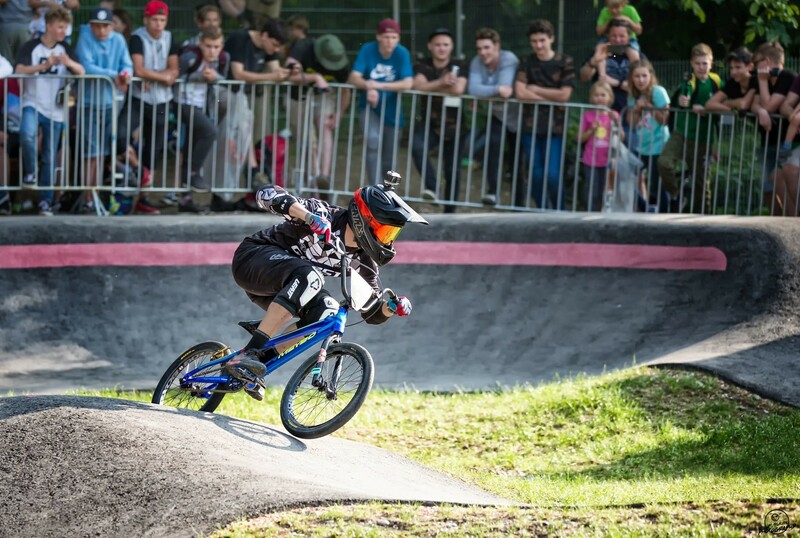 So why did you choose the BMX for the event in Neunkirchen? First of all you need to know that this was the first project by Velosolutions in Austria. They only had a very small area that could be used for building, therefore that pump track is extremely tight. Too tight for my 4X bike that has a way longer wheelbase than the small dirt jump frames. It just does not fit into most of the doubles. I realized that if I want to use my best chance to qualify, I simply have to race my small BMX. For the Worlds, on a bigger track, my plan is to use my every day Ghost 4X Bike – but for sure I will bring both.. Most riders are only BMX or MTB athletes. You are one of a few who has raced every bike from 20” up to 29” at a very high level. With your experience as background, what are the pros and cons of a BMX or a hardtail MTB as you see them? The BMX is very light and very stiff. So all your power is turned into speed in the most effecient and quickest way possible. That means if time counts out of a standing position the BMX may have a small advantage…or if you make a small mistake you can get your track speed back quite fast. Let’s be honest though, if you make a mistake in your run at the Worlds you are out anyways. HOWEVER, a BMX is not easy to handle in those tight turns. Once you are up to speed, a MTB with the 26” wheels truly has better grip in the turns, it feels more stable, more economical and that’s very important if lap times are longer. It feels a little bit easier to have a clean lap, even if fatigue becomes a factor. Not many riders can claim to be part of both scenes. How do you feel about the BMX vs. MTB rivalry that comes up from time to time? One of the visitors saw that I raced my BMX and commented that he "is disappointed about it” like he meant to say I was cheating or betraying MTB somehow. I really hated it, because if it would be easier or better on the BMX everyone would do it – but most riders simply cannot ride it fast enough and that’s really the point. 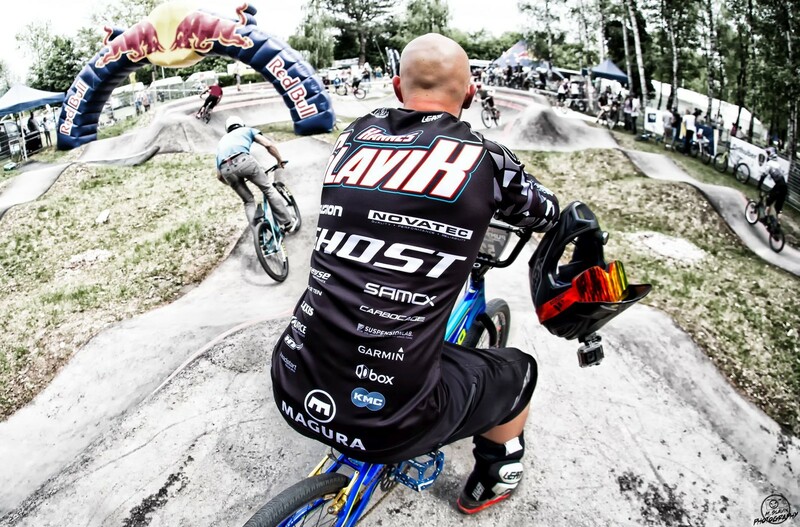 Racing a BMX on that track is not easier or better, it’s just different. As I said both bikes have their good and bad aspects and whoever is on the top spot at the end 20” 24” 26” or 27.5” 29” this athlete simply has been the fastest on the day. Nothing more to discuss or assess about this. Speaking as a coach and sports scientist, which discipline do you see as giving an athlete the best chance to win the Pump Track Worlds, considering both the physical and skills aspects? Quite a tough question…first of all I want to point out that this is the fascinating factor about this event. All riders come together: we have BMX, 4X, DH, Dirt, CX athletes at one event. Now, if you want to be fast you have to generate a lot of speed by pushing and manualing the rollers and doubles. Higher muscle "fast twitch power" means higher speed if the technique is perfect. 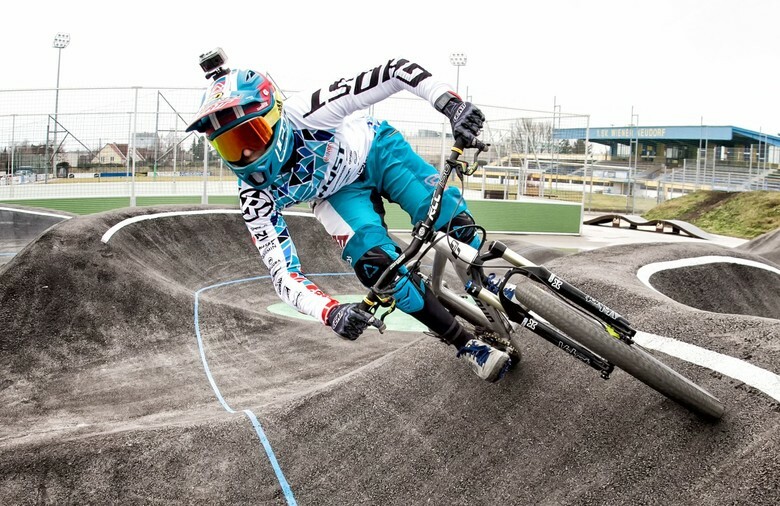 So BMX athletes normally have high maximum strength and great technique as a result of their daily practice and workout. But all that speed means nothing if you don’t get through the tight turns. There the DH guys will make the asphalt burn. Not a challenge for those guys, but they are usually not conditioned for maximum fast twitch power for the pure speed generating part. We 4X riders do a lot of strength training too, but as much pushing like the BMX athletes and not as much berm riding like the DH athletes - on the other hand we do feel very confident on hardtail bikes…we are the complete package! Of course, some dirt jump athletes are full of skills and also well trained nowadays which makes them dangerous for sure. At the end you will need that one perfect lap – I think many riders have the skills to win, but putting everything together when it counts and you are tired too is something totally different. When all is said and done, staying clean and the length of the track (endurance) will separate the good riders from the excellent ones. The winner's run will be fascinating to watch, that’s for sure! Didn't the promoters get the memo to have competitors remove their chains? Fair is fair. 1/4 pedal strokes add speed. Love running my GT 24" cruiser on pumptracks!